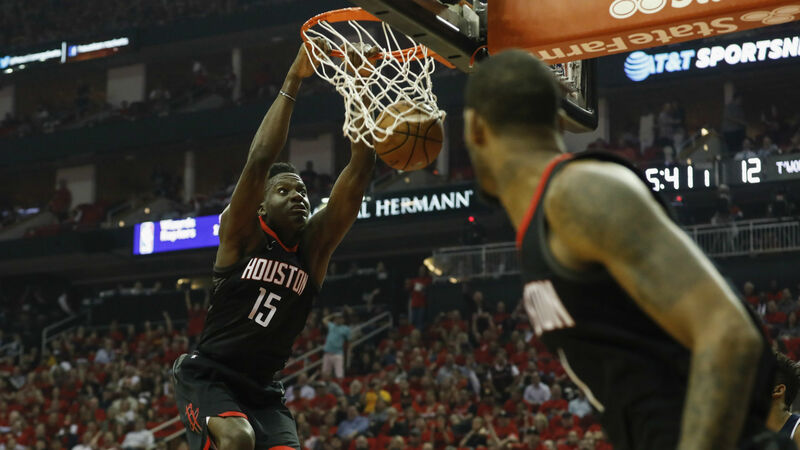 The Rockets got an offseason win Friday after finally reaching an agreement with starting center Clint Capela, bringing an end to a drawn-out and occasionally frustrating process. There are no team or player options in the deal, according to The Athletic’s Michael Scotto, so the Rockets will keep the 24-year-old just as he hits his prime years. After the way free agency unfolded this summer, that’s good news Houston natives needed to hear. Following the short-lived LeBron James dream, the Rockets locked up Chris Paul for the foreseeable future but watched Trevor Ariza sign with the Suns and Luc Mbah a Moute leave for the Clippers as free agents. Ariza and Mbah a Moute played significant roles in Houston’s top-10 defense, allowing the Rockets to use a switch-heavy scheme without falling victim to mismatches. Those are the exact kind of players a contender needs against the champion Warriors, a team that just so happened to acquire another All-Star in DeMarcus Cousins. (They really needed to catch a break, after all.) The Golden State gap only got larger this offseason after the Rockets nearly pulled off the impossible in the Western Conference finals. Sure, Houston found what could be a gem in James Ennis III and will eventually sign Carmelo Anthony, but are those guys ready for the playoff wars? And how much can they really help against these Warriors? The Rockets know what Capela gives them. He is one of the elite two-way centers in the NBA and is fresh off his best season. He averaged 13.9 points on a league-leading 65.2 percent shooting while snagging 10.8 rebounds and tallying 1.9 blocks per game. He is the ideal rim-runner for Paul and James Harden off pick-and-rolls, and he is fully capable of both protecting the basket and sliding his feet along the perimeter defensively. It’s not just about what the Rockets maintain on the floor, though. This contract is a flat-out steal. Capela will be making significantly less on his extension than similar centers Rudy Gobert (four years, $102 million) and Steven Adams (four years, $100 million). Capela will earn less on average ($18 million) than Bulls guard Zach LaVine ($19.5 million). That’s incredible value for a player who will continue to improve over the length of the deal. Perhaps more importantly, this contract prevents Capela from hitting the market next year as an unrestricted free agent, which would have removed any possibility of matching an offer from another suitor. Now Rockets general manager Daryl Morey can build around the Harden-Paul-Capela core for the next few years. It’s a winning formula — Houston went 42-3 when those three played together during the regular season. It may have been a product of circumstance with few teams outside of Houston needing all of what Capela provides, but the Rockets had an incentive to reach an agreement now, and they don’t care how long it took to cross the finish line. Capela’s deal is a bargain, one that should allow Rockets fans to breathe a sigh of relief in the midst of a less-than-perfect summer.